The great Milky Way -Andromeda collision. During the late stages of galaxy mergers or galactic interactions,supergiant molecular cloud complexes are turned into large numbers ofstellar superclusters. Supergiant molecular cloud complexes show fractalstructure due to turbulence and/or self-gravitation; therefore,superclusters formed out of these complexes are expected to exhibitsimilar geometry. Here we study the evolution of the multifractalpattern of the projected spatial distribution of supergiant molecularcloud complexes in the Antennae (NGC 4038/4039) as they turn intosuperclusters during the sustained starburst event. Using two data setsof the positions of supergiant molecular clouds and of stellarsuperclusters, the fractal spectrum is determined using theMinkowski-sausage method to calculate the Minkowski-Bouligand dimensionas a function of the parameter q. For clouds, this measure varies with qin the range 0.7-2.2 for q in the interval [-4, 4]. For the projecteddistribution of superstar clusters it varies with q in the range1.15-1.71. For the overlap region in the Antennae, the average projectedfractal dimension of supergiant clouds is found to be 1.3 and theaverage fractal dimension of superclusters is 1.6. Our results indicatethat during star formation the local fractal dimension increases, likelydue to diffusion-like evolution. We report on the discovery of several compact regions of mid-infraredemission in the star-forming circumnuclear disc of the starburst/Seyfert2 galaxy NGC 7582. The compact sources do not have counterparts in theoptical and near-infrared, suggesting that they are deeply embedded indust. We use the [NeII] 12.8-μm line emission to estimate theemission measure of the ionized gas, which in turn is used to assess thenumber of ionizing photons. Two of the brighter sources are found tohave ionizing fluxes of ~2.5 × 1052, whereas thefainter ones have ~1 × 1052 photon s-1.Comparing with a 1-Myr-old starburst, we derive stellar masses in therange 3-5 × 105Msolar and find that thenumber of O stars in each compact source is typically 0.6-1.6 ×103. We conclude that the compact mid-infrared sources arelikely to be young, embedded star clusters, of which only a few areknown so far. Our observation highlights the need for high-resolutionmid-infrared imaging to discover and study embedded star clusters in theproximity of active galactic nuclei. We present detailed luminosity profiles of the young massive clustersM82-F, NGC 1569-A and NGC 1705-1 which show significant departures fromequilibrium (King and Elson, Fall & Freeman) profiles. We comparethese profiles with those from N-body simulations of clusters that haveundergone the rapid removal of a significant fraction of their mass as aresult of gas expulsion. We show that the observations and simulationsagree very well with each other, suggesting that these young clustersare undergoing violent relaxation and are also losing a significantfraction of their stellar mass.That these clusters are not in equilibrium can explain the discrepantmass-to-light ratios observed in many young clusters with respect tosimple stellar population models without resorting to non-standardinitial stellar mass functions as claimed for M82-F and NGC 1705-1. Wealso discuss the effect of rapid gas removal on the complete disruptionof a large fraction of young massive clusters (`infant mortality').Finally, we note that even bound clusters may lose >50 per cent oftheir initial stellar mass as a result of rapid gas loss (`infantweight-loss'). The mass of unresolved young star clusters derived fromspectrophotometric data may well be off by a factor of 2 or more oncethe migration of massive stars driven by mass segregation is accountedfor. We quantify this effect for a large set of cluster parameters,including variations in the stellar initial mass function (IMF), theintrinsic cluster mass, and mean mass density. Gas-dynamical modelscoupled with the Cambridge stellar evolution tracks allow us to derive ascheme to recover the real cluster mass given measured half-lightradius, one-dimensional velocity dispersion and age. We monitor theevolution with time of the ratio of real to apparent mass through theparameter η. When we compute η for rich star clusters, we findnon-monotonic evolution in time when the IMF stretches beyond a criticalcut-off mass of 25.5Msolar. We also monitor the rise ofcolour gradients between the inner and outer volume of clusters: we findtrends in time of the stellar IMF power indices overlapping well withthose derived for the Large Magellanic Cloud cluster NGC 1818 at an ageof 30Myr. We argue that the core region of massive Antennae clustersshould have suffered from much segregation despite their low ages. Weapply these results to a cluster mass function, and find that the peakof the mass distribution would appear to observers shifted to lowermasses by as much as 0.2dex. 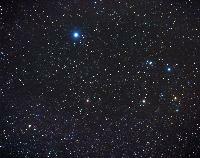 The star formation rate derived for thecluster population is then underestimated by from 20 to 50 per cent. We present an analysis of 13 of the best quality ultraluminous X-raysource (ULX) data sets available from XMM-Newton European Photon ImagingCamera (EPIC) observations. We utilize the high signal-to-noise in theseULX spectra to investigate the best descriptions of their spectral shapein the 0.3-10keV range. Simple models of an absorbed power law ormulticolour disc blackbody prove inadequate at describing the spectra.Better fits are found using a combination of these two components, withboth variants of this model - a cool (~0.2keV) disc blackbody plus hardpower-law continuum, and a soft power-law continuum, dominant at lowenergies, plus a warm (~1.7keV) disc blackbody - providing good fits to8/13 ULX spectra. However, by examining the data above 2keV, we findevidence for curvature in the majority of data sets (8/13 with at leastmarginal detections), inconsistent with the dominance of a power law inthis regime. In fact, the most successful empirical description of thespectra proved to be a combination of a cool (~0.2keV) classic blackbodyspectrum, plus a warm disc blackbody that fits acceptably to 10/13 ULXs.The best overall fits are provided by a physically self-consistentaccretion disc plus Comptonized corona model (DISKPN + EQPAIR), whichfits acceptably to 11/13 ULXs. This model provides a physicalexplanation for the spectral curvature, namely that it originates in anoptically thick corona, though the accretion disc photons seeding thiscorona still originate in an apparently cool disc. We note similaritiesbetween this fit and models of Galactic black hole binaries at highaccretion rates, most notably the model of Done & Kubota. In thisscenario the inner disc and corona become energetically coupled at highaccretion rates, resulting in a cooled accretion disc and opticallythick corona. We conclude that this analysis of the best spectral datafor ULXs shows it to be plausible that the majority of the populationare high accretion rate stellar-mass (perhaps up to 80Msolar)black holes, though we cannot categorically rule out the presence oflarger, ~1000-Msolar intermediate-mass black holes (IMBHs) inindividual sources with the current X-ray data. We report the results of a study of X-ray point sources coincident withthe high-velocity system (HVS) projected in front of NGC1275. A verydeep X-ray image of the core of the Perseus cluster, made with theChandra X-ray Observatory, has been used. We find a population ofultraluminous X-ray sources [ULXs seven sources with LX(0.5 -7.0 keV) > 7 × 1039ergs-1]. 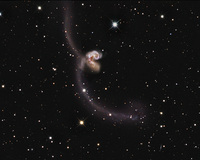 As with theULX populations in the Antennae and Cartwheel galaxies, those in the HVSare associated with a region of very active star formation. Severalsources have possible optical counterparts found on the Hubble SpaceTelescope (HST) images, although the X-ray brightest one does not.Absorbed power-law models fit the X-ray spectra, with most having aphoton index between 2 and 3. How well do we know the age and mass distributions of the star cluster system in the Large Magellanic Cloud? The Large Magellanic Cloud (LMC) star cluster system offers the uniqueopportunity to independently check the accuracy of age (and thecorresponding mass) determinations based on a number of complementarytechniques. Using our sophisticated tool for star cluster analysis basedon broad-band spectral energy distributions (SEDs), `AnalySED', were-analyse the Hunter et al. LMC cluster photometry. Our main aim is toset the tightest limits yet on the accuracy of absolute agedeterminations based on broad-band SEDs, and therefore on the usefulnessof such an approach. Our broad-band SED fits yield reliable ages, withstatistical absolute uncertainties within Δlog(Age/yr) ~= 0.4overall. The systematic differences we find with respect to previous agedeterminations are caused by conversions of the observational photometryto a different filter system, thus leading to systematically inaccurateresults.The LMC's cluster formation rate (CFR) has been roughly constant outsideof the well-known age gap between ~3 and 13Gyr, when the CFR was afactor of ~5 lower. Using a simple approach to derive the characteristiccluster disruption time-scale, we find thatlog(tdis4/yr) = 9.9 +/- 0.1, wheretdis=tdis4(Mcl/104Msolar)0.62.This long characteristic disruption time-scale implies that we areobserving the initial cluster mass function (CMF). We conclude thatwhile the older cluster (sub)samples show CMF slopes that are fullyconsistent with the α~=-2 slopes generally observed in young starcluster systems, the youngest mass and luminosity-limited LMC clustersubsets show shallower slopes (at least below masses of a few×103Msolar), which is contrary to dynamicalexpectations. This may imply that the initial CMF slope of the LMCcluster system as a whole is not well represented by a power law,although we cannot disentangle the unbound from the bound clusters atthe youngest ages. We demonstrate that the mass of the most massive star in a clustercorrelates non-trivially with the cluster mass. A simple algorithm,according to which a cluster is filled up with stars that are chosenrandomly from the standard initial mass function (IMF) but sorted withincreasing mass, yields an excellent description of the observationaldata. Algorithms based on random sampling from the IMF without sortedadding are ruled out with a confidence larger than 0.9999. A physicalexplanation of this would be that a cluster forms by more-massive starsbeing consecutively added until the resulting feedback energy sufficesto revert cloud contraction and stops further star formation. This hasimportant implications for composite populations. For example,104 clusters of mass 102Msolar will notproduce the same IMF as one cluster with a mass of106Msolar. It also supports the notion that theintegrated galaxial stellar IMF (IGIMF) should be steeper than thestellar IMF and that it should vary with the star formation rate of agalaxy. We present the properties of the discrete X-ray sources detected in ourmonitoring survey of the Antennae galaxies with Chandra ACIS-S. Wedetect ~70 sources down to a typical luminosity of7×1037 ergs s-1 in each of the sixmonitoring observations. In the co-added observation (which has a totalexposure of 411 ks) we detect a total of 120 sources down to aluminosity of (2-5)×1037 ergs s-1, dependingon the local background. Fifteen sources have a strong extendedcomponent. Fourteen of the pointlike sources have luminosities above1039 ergs s-1, at least in one exposure, whichqualifies them as ultraluminous X-ray sources (ULXs). Ten of the ULXsshow long-term variability, while one is observed only once, suggestingthat it is a transient source. We find that 25 sources exhibit long-termvariability clearly associating them with accreting compact objects.Twenty-one sources also show spectral variability. However, theirvariability patterns are diverse, indicating that they belong todifferent source classes. Finally, we find a weak excess of hard sourcesat the low luminosities that we tentatively associate with pulsar X-raybinaries. We present a systematic analysis of archival HST WFPC2 ``Association''data sets that correlate with the Chandra positions of a set of 44ultraluminous X-ray sources (ULXs) of nearby galaxies. The mainmotivation is to address the nature of ULXs by searching for opticalcounterparts. 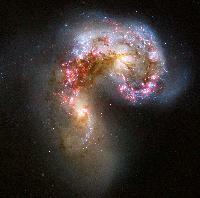 Sixteen of the ULXs are found in early-type galaxies (RC3Hubble type <3). We have improved the Chandra/HST relative astrometrywhenever possible, resulting in errors circles of 0.3"-1.7" in size.Disparate numbers of potential ULX counterparts are found, and in somecases none are found. The lack of or low number of counterparts in somecases may be due to insufficient depth in the WFPC2 images. Particularlyin late-type galaxies, the HST image in the ULX region was often complexor crowded, requiring source detection to be performed manually. Wetherefore address various scenarios for the nature of the ULX since itis not known which, if any, of the sources found are true counterparts.The optical luminosities of the sources are typically in the range104-106 Lsolar, with (effective) Vmagnitudes typically in the range 22-24. In several cases colorinformation is available, with the colors roughly tending to be more redin early-type galaxies. This suggests that, in general, the (potential)counterparts found in early-type galaxies are likely to be older stellarpopulations and are probably globular clusters. Several early-typegalaxy counterparts have blue colors, which may be due to youngerstellar populations in the host galaxies, however, these could also bebackground sources. In spiral galaxies the sources may also be due tolocalized structure in the disks rather than bound stellar systems.Alternatively, some of the counterparts in late-type galaxies may beisolated supergiant stars. The observed X-ray/optical flux ratio isdiluted by the optical emission of the cluster in cases where the systemis an X-ray binary in a cluster, particularly in the case of a low-massX-ray binaries in an old cluster. If any of the counterparts are boundsystems with ~104-106 stars and are the truecounterparts to the ULX sources, then the X-ray luminosities of the ULXare generally well below the Eddington limit for a black hole with mass~0.1% of the cluster mass. Finally, we find that the optical flux of thecounterparts is consistent with being dominated by emission from anaccretion disk around an intermediate-mass black hole if the black holehappens to have a mass >~102 Msolar and isaccreting at close to the Eddington rate, unless the accretion disk isirradiated (which would result in high optical disk luminosities atlower black hole masses).Based on observations made with the NASA/ESA Hubble Space Telescope,obtained from the Data Archive at the Space Telescope Science Institute,which is operated by the Association of Universities for Research inAstronomy, Inc., under NASA contract NAS 5-26555. This project isassociated with Archival proposal 9545. We present an analysis of the properties of the hot interstellar medium(ISM) in the merging pair of galaxies known as the Antennae (NGC4038/4039), performed using the deep, co-added ~411 ks Chandra ACIS-Sdata set. These deep X-ray observations and Chandra's high angularresolution allow us to investigate the properties of the hot ISM withunprecedented spatial and spectral resolution. Through a spatiallyresolved spectral analysis, we find a variety of temperatures (from 0.2to 0.7 keV) and NH (from Galactic to 2×1021cm-2). Metal abundances for Ne, Mg, Si, and Fe varydramatically throughout the ISM from subsolar values (~0.2) up toseveral times solar. We present Spitzer observations of the nearby dwarf starburst galaxy NGC1705 obtained as part of the Spitzer Infrared Nearby Galaxies Survey.The galaxy morphology is very different shortward and longward of ~5μm: optical and short-wavelength IRAC imaging shows an underlying redstellar population, with the central super star cluster (SSC) dominatingthe luminosity; longer wavelength IRAC and MIPS imaging reveals warmdust emission arising from two off-nuclear regions that are offset by~250 pc from the SSC and that dominate the far-IR flux of the system.These regions show little extinction at optical wavelengths. The galaxyhas a relatively low global dust mass (~2 × 105Msolar, implying a global dust-to-gas mass ratio ~2-4 timeslower than the Milky Way average, roughly consistent with themetallicity decrease). The off-nuclear dust emission appears to bepowered by photons from the same stellar population responsible for theexcitation of the observed Hα emission; these photons areunassociated with the SSC (although a contribution from embedded sourcesto the IR luminosity of the off-nuclear regions cannot be ruled out).Low-resolution IRS spectroscopy shows moderate-strength PAH emission inthe 11.3 μm band in the more luminous eastern peak; no PAH emissionis detected in the SSC or the western dust emission complex. There issignificant diffuse emission in the IRAC 8 μm band after starlighthas been removed by scaling shorter wavelength data; the fact that IRSspectroscopy shows spatially variable PAH emission strengths compared tothe local continuum within this diffuse gas suggests caution in theinterpretation of IRAC diffuse 8 μm emission as arising from PAHcarriers alone. The nebular metallicity of NGC 1705 falls at thetransition level of ~0.35 Zsolar found by Engelbracht andcollaborators, below which PAH emission is difficult to detect; the factthat a system at this metallicity shows spatially variable PAH emissiondemonstrates the complexity of interpreting diffuse 8 μm emission ingalaxies. NGC 1705 deviates significantly from the canonicalfar-infrared versus radio correlation, having significant far-infraredemission but no detected radio continuum. We analyze extensive data on NGC 1377 from the Spitzer Infrared NearbyGalaxies Survey (SINGS). Within the category of nascent starbursts thatwe previously selected as having infrared-to-radio continuum ratios inlarge excess of the average and containing hot dust, NGC 1377 has thelargest infrared excess yet measured. Optical imaging reveals amorphological distortion suggestive of a recent accretion event.Infrared spectroscopy reveals a compact and opaque source dominated by ahot, self-absorbed continuum (τ~20 in the 10 μm silicate band).We provide physical evidence against nonstellar activity being theheating source. H II regions are detected through the single [Ne II]line, probing <1% of the ionizing radiation. Not only is the opticaldepth in different gas and dust phases very high, but >85% ofionizing photons are suppressed by dust. The only other detectedemission features are molecular hydrogen lines, arguably excited mainlyby shocks, besides photodissociation regions, and weak aromatic bands.The new observations support our interpretation in terms of an extremelyyoung starburst (<1 Myr). More generally, galaxies deficient in radiosynchrotron emission are likely observed within a few Myr of the onsetof a starburst and after a long quiescence, prior to the replenishmentof the interstellar medium with cosmic rays. The similar infrared-radioproperties of NGC 1377 and some infrared-luminous galaxies suggest thatNGC 1377 constitutes an archetype that will be useful to betterunderstand starburst evolution. Although rare locally because observedin a brief evolutionary stage, nascent starbursts may represent anonnegligible fraction of merger-induced starbursts that dominate deepinfrared counts. Since they differ dramatically from usual starbursttemplates, they have important consequences for the interpretation ofdeep surveys. Merging of Globular Clusters in Inner Galactic Regions. I. Do They Survive the Tidal Interaction? The main topic of this paper is the investigation of the modes ofinteraction of globular clusters (GCs) moving in the inner part of agalaxy. This is tackled by means of high-resolution N-body simulations,whose first results are presented in this article. Our simulations dealtwith primordial, very massive (of the order of 107Msolar) GCs that were able to decay, because of dynamicalfriction, into the inner regions of triaxial galaxies on a timescalemuch shorter than their internal relaxation time. To check thedisruptive roles of both tidal forces and GC-GC collisions, theireffects were maximized by considering clusters on quasi-radial orbitsand choosing the initial conditions so as to give head-on collisions ateach passage through the center. The available CPU resources allowed usto simulate clusters with different structural parameters and to followthem on quasi-radial orbits during eight passages across the center. Themain findings are as follows: (1) clusters with an initial high-enoughKing concentration parameter (c>=1.2) preserve up to 50% of theirinitial mass, (2) the inner density distribution of the survivingclusters keeps a King model profile, (3) GC-GC collisions have anegligible effect compared with that caused by the passage through thegalactic center, (4) the orbital energy dissipation due to the tidalinteraction is of the same order as that caused by dynamical friction,(5) complex substructures like ``ripples'' and ``clumps'' are formed, asobserved around real clusters. These findings support the validity ofthe hypothesis of merging of GCs in the galactic central region, withmodes that deserve further careful investigation. Close Binary Interactions of Intermediate-Mass Black Holes: Possible Ultraluminous X-Ray Sources? While many observed ultraluminous X-ray sources (ULXs;LX>=1039 ergs s-1) could beextragalactic X-ray binaries (XRBs) emitting close to the Eddingtonlimit, the highest luminosity ULXs(LX>3×1039 ergs s-1) exceedthe isotropic Eddington luminosity for even high-stellar-mass-accretingblack hole XRBs. It has been suggested that these highest luminosityULXs may contain accreting intermediate-mass black hole (IMBH) binaries.We consider this hypothesis for dense, young (~100 Myr) stellar clusterswhere we assume that a 50-500 Msolar central IMBH has formedthrough runaway growth of a massive star. We develop numericalsimulations of such clusters' cores by combining single and binary starevolutionary syntheses with a simple treatment of dynamicalinteractions. We model interactions of the IMBH with single and binarystars, as well as single-binary and binary-binary interactions, but notthe formation of a cusp around the IMBH. The core density and velocitydispersion are assumed to be constant over 100 Myr. We investigate thesuccession of IMBH binary companions and the evolution of their orbitalparameters to obtain estimates of the incidence of mass transfer phasesand possible ULX activity involving the IMBH. We find that although itis common for the central black hole to acquire binary companions, thereis a very low probability that these interacting binaries will becomeobservable ULX sources. The statistical properties of the nonnuclear X-ray point sources fromthe ROSAT HRI survey of nearby galaxies in Paper I are studied, withparticular attention to the contamination from background and/orforeground objects. This study reveals a statistical preference for theultraluminous X-ray sources (ULXs) to occur in late-type galaxies overearly-type galaxies, and in starburst/H II galaxies over nonstarburstgalaxies. There is a trend of greater occurrence frequencies and ULXrates for galaxies with increasing star formation rates, confirming theconnection between the ULX phenomenon and the star formation. Anonlinear correlation is found between the number of ULXs and the starformation rate, with significantly more ULXs at low star formation ratesthan the ULX population expected from the high-mass X-ray binaries(HMXBs) as an indicator of the star formation and the accompanying youngstellar population, suggestive of another population of ULXs associatedwith the low-mass X-ray binaries (LMXBs) and the old stellar population.There are no breaks around 1039 ergs s-1 in theluminosity functions of ULXs in all galaxies or in late-type galaxies,suggesting the regular ULXs below 1040 ergs s-1are a high-luminosity extension of the ordinary HMXB/LMXB populationsbelow 1039 ergs s-1. There is evidence that theextreme ULXs above 1040 ergs s-1 might be adifferent ULX class from the regular ULXs below 1040 ergss-1, although a larger sample with more ULXs is needed toestablish the statistical properties of the extreme ULXs as a class. IC 2163 and NGC 2207 are interacting galaxies that have been wellstudied at optical and radio wavelengths and simulated in numericalmodels to reproduce the observed kinematics and morphological features.Spitzer IRAC and MIPS observations reported here show over 200 brightclumps from young star complexes. The brightest IR clump is amorphologically peculiar region of star formation in the western arm ofNGC 2207. This clump, which dominates the Hα and radio continuumemission from both galaxies, accounts for ~12% of the total 24 μmflux. Nearly half of the clumps are regularly spaced along somefilamentary structure, whether in the starburst oval of IC 2163 or inthe thin spiral arms of NGC 2207. This regularity appears to influencethe clump luminosity function, making it peaked at a value nearly afactor of 10 above the completeness limit, particularly in the starburstoval. This is unlike the optical clusters inside the clumps, which havea luminosity function consistent with the usual power-law form. Thegiant IR clumps presumably formed by gravitational instabilities in thecompressed gas of the oval and the spiral arms, whereas the individualclusters formed by more chaotic processes, such as turbulencecompression, inside these larger scale structures. We present new optical observations of young massive star clusters inArp 220, the nearest ultraluminous infrared galaxy, taken in UBVI withthe Hubble Space Telescope ACS HRC camera. We find a total of 206probable clusters whose spatial distribution is centrally concentratedtoward the nucleus of Arp 220. We use model star cluster tracks todetermine ages, luminosities, and masses for 14 clusters with completeUBVI indices or previously published near-infrared data. We estimaterough masses for 24 additional clusters with I<24 mag from BVIindices alone. The clusters with useful ages fall into two distinctgroups: a ``young'' population (<10 Myr) and an intermediate-agepopulation (~=300 Myr). There are many clusters with masses clearlyabove 106 Msolar and possibly even above107 Msolar in the most extreme instances. Thesemasses are high enough that the clusters being formed in the Arp 220starburst can be considered to be genuine young globular clusters. Inaddition, this study allows us to extend the observed correlationbetween global star formation rate and maximum cluster luminosity bymore than 1 order of magnitude in star formation rate. We present high-resolution 890 μm images of two 20 mJy submillimetergalaxies, SMM J123711+622212 and MIPS J142824.0+352619, obtained usingthe Submillimeter Array (SMA). Using submillimeter interferometricobservations with an angular resolution of 2.5", the coordinates ofthese high-redshift sources are determined with an accuracy of 0.2". Thenew SMA data on SMM J123711+622212 reveal an unresolved submillimetersource offset to the east by 0.8" from an optical galaxy found in deepHST images, suggesting either a large galaxy with a dusty central regionor an interacting galaxy system. The SMA image of hyperluminous(LFIR=3.2×1013 Lsolar) sourceMIPS J142824.0+352619 provides a firm upper limit to the source size of<~1.2". This constraint provides evidence that the foreground lens isonly weakly affecting the observed high far-infrared luminosity. We observed two faint tidal dwarf galaxies (TDGs), NGC 5291 N and NGC5291 S, with the Infrared Spectrograph on the Spitzer Space Telescope.We detect strong polycyclic aromatic hydrocarbon (PAH) emission at 6.2,7.7, 8.6, 11.3, 12.6, and 16.5 μm, which match models of groups of~100 carbon atoms with an equal mixture of neutral and ionized PAHs. TheTDGs have a dominant warm (~140 K) dust component in marked contrast tothe cooler (40-60 K) dust found in starburst galaxies. For the firsttime we detect the low-J rotational lines from molecular hydrogen.Adopting LTE, there is ~105 Msolar of ~400 K gas,which is <0.1% of the cold gas mass inferred from 12CO(1-0) measurements. The combination of one-third solar metallicity witha recent (<5 million year) episode of star formation is reflected inthe S and Ne ratios. The excitation is higher than typical values forstarburst galaxies and similar to that found in BCDs. Using the InfraredArray Camera, we identify an additional 13 PAH-rich candidate TDGs.These sources occupy a distinct region of IRAC color space with[3.6]-[4.5]<0.4 and [4.5]-[8.0]>3.2. 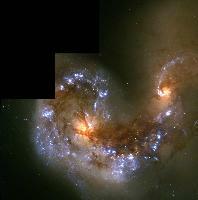 Their disturbed morphologiessuggest past merger events between companions; for example, NGC 5291 Shas a projected 11 kpc tail. NGC 5291 N and S have stellar masses of(1.5 and 3.0)×108 Msolar, which iscomparable to BCDs, although still roughly 10% of the LMC's stellarmass. The candidate TDGs are an order of magnitude less massive. Thissystem appears to be a remarkable TDG nursery. We present numerical three-body experiments that include the effects ofgravitational radiation reaction by using equations of motion thatinclude the 2.5-order post-Newtonian force terms, which are theleading-order terms of energy loss from gravitational waves. We simulatebinary-single interactions and show that close-approach cross sectionsfor three 1 Msolar objects are unchanged from the purelyNewtonian dynamics except for close approaches smaller than10-5 times the initial semimajor axis of the binary. We alsopresent cross sections for mergers resulting from gravitationalradiation during three-body encounters for a range of binary semimajoraxes and mass ratios including those of interest for intermediate-massblack holes (IMBHs). Building on previous work, we simulate sequences ofhigh-mass-ratio three-body encounters that include the effects ofgravitational radiation. The simulations show that the binaries mergewith extremely high eccentricity such that when the gravitational wavesare detectable by LISA, most of the binaries will have eccentricitiese>0.9, although all will have circularized by the time they aredetectable by LIGO. We also investigate the implications for theformation and growth of IMBHs and find that the inclusion ofgravitational waves during the encounter results in roughly half as manyblack holes ejected from the host cluster for each black hole accretedonto the growing IMBH. The observed far greater number of giant arcs than that predicted by theΛCDM cosmology has been a long-standing puzzle. We adopthigh-resolution cosmological simulations to assess this problem andquantitatively show that this issue can be resolved by inclusion ofhigh-redshift source galaxies. Our ΛCDM results reveal a muchhigher giant-arc probability (>10-5) for source galaxiesof z>2 than that for z<2. Together with the source redshiftdistribution derived from the NTT catalogs, we obtain the predictedgiant-arc number counts, which turn out to be consistent with mostobservations. The fact that the high-redshift (z>=1.5) galaxies arepreferentially magnified by the foreground lenses with a surprisinglyhigh efficiency explains why previous theoretical work substantiallyunderestimated the giant-arc number density. In previous work, thesource galaxies were assumed to be mostly around z=1, an assumptioncommonly adopted in weak-lensing studies. In addition, although the lensmergers have been found to yield enhanced lensing cross sections, wefind that merely 5% of giant arcs are associated with merging lenses.Our results support not only the ΛCDM cosmology but also thelong-standing anticipation that galaxy clusters, mostly formed belowz=1, are powerful gravitational telescopes for probing the high-redshiftprotogalaxies. We illustrate how the patchy dust regions in interactinggalaxies at z=4 may appear as filamentary structures within a giant arcwhen observed at the submillimeter wave band. We present a Chandra study of the emission-weighted metal abundances in28 early-type galaxies, spanning ~3 orders of magnitude in X-rayluminosity (LX). We report constraints for Fe, O, Ne, Mg, Si,S, and Ni. We find no evidence of the very subsolar Fe abundance(ZFe) historically reported, confirming a trend in recentobservations of bright galaxies and groups, nor do we find anycorrelation between ZFe and luminosity. Excepting one case,the ISM is single-phase, indicating that multitemperature fits foundwith ASCA reflected temperature gradients that we resolve with Chandra.We find no evidence that ZFe (ISM) is substantially lowerthan the stellar metallicity estimated from simple stellar populationmodels. In general, these quantities are similar, which is inconsistentwith galactic wind models and recent hierarchical chemical enrichmentsimulations. Our abundance ratio constraints imply that 66%+/-11% of theISM Fe was produced in SNe Ia, similar to the solar neighborhood,indicating similar enrichment histories for elliptical galaxies and theMilky Way. Although these values are sensitive to the considerablesystematic uncertainty in the supernova yields, they are in agreementwith observations of more massive systems. This indicates considerablehomology in the enrichment process operating from cluster scales tolow-to-intermediate-LX galaxies. The data uniformly exhibitlow ZO/ZMg ratios, which have been reported insome clusters, groups, and galaxies. This is inconsistent with standardSN II metal yield calculations and may indicate an additional source ofenrichment, such as Population III hypernovae. We investigate the physical properties of the interstellar medium (ISM)in the merging pair of galaxies known as the Antennae (NGC 4038/4039),using the deep co-added ~411 ks Chandra ACIS-S data set. The method ofanalysis and some of the main results from the spectral analysis, suchas metal abundances and their variations from ~0.2 to ~20-30 timessolar, are described in Paper I (Baldi et al.). In the present paper weinvestigate in detail the physics of the hot emitting gas, derivingmeasures for the hot gas mass (~107 Msolar),cooling times (107-108 yr), and pressure(3.5×10-11-2.8×10-10 dynecm-2). In at least one of the two nuclei (NGC 4038), the hotgas pressure is significantly higher than the CO pressure, implying thatshock waves may be driven into the CO clouds. Comparison of the metalabundances with the average stellar yields predicted by theoreticalmodels of SN explosions points to SNe of Type II as the maincontributors of metals to the hot ISM. There is no evidence of anycorrelation between radio-optical star formation indicators and themeasured metal abundances. Although due to uncertainties in the averagegas density we cannot exclude that mixing may have played an importantrole, the short time required to produce the observed metal masses(<~2 Myr) suggests that the correlations are unlikely to have beendestroyed by efficient mixing. More likely, a significant fraction ofType II SN ejecta may be in a cool phase, in grains, or escaping in hotwinds. In each case, any such fraction of the ejecta would remainundetectable with soft X-ray observations. Based on deep Very Large Telescope Infrared Spectrometer and ArrayCamera JHK photometry, we have derived the present-day mass function(MF) of the central starburst cluster NGC 3603 YC (Young Cluster) in thegiant H II region NGC 3603. The effects of field contamination,individual reddening, and a possible binary contribution areinvestigated. The MF slopes resulting from the different methods arecompared and lead to a surprisingly consistent cluster MF with a slopeof Γ=-0.9+/-0.15. Analyzing different radial annuli around thecluster core, no significant change in the slope of the MF is observed.However, mass segregation in the cluster is evidenced by the increasingdepletion of the high-mass tail of the stellar mass distribution withincreasing radius. We discuss the indications of mass segregation withrespect to the changes observed in the binned and cumulative stellar MFsand argue that the cumulative function, as well as the fraction of high-to low-mass stars, provides better indicators for mass segregation thanthe MF slope alone. Finally, the observed MF and starburst morphology ofNGC 3603 YC are discussed in the context of massive local star-formingregions such as the Galactic center Arches cluster, R136/30 Dor in theLMC, and the Orion Trapezium cluster, all providing resolved templatesfor extragalactic star formation. Despite the similarity in the observedMF slopes, dynamical considerations suggest that the starburst clustersdo not form gravitationally bound systems over a Hubble time. Both theenvironment (gravitational potential of the Milky Way) and theconcentration of stars in the cluster core determine the dynamicalstability of a dense star cluster, such that the long-term evolution ofa starburst is not exclusively determined by the stellar evolution ofits members, as frequently assumed for globular cluster systems.Based on observations obtained at the ESO Very Large Telescope onParanal, Chile, under programs 63.I-0015 and 65.I-0135. Various formation channels for the puzzling ultracompact dwarf galaxies(UCDs) have been proposed in the last few years. To better judge some ofthe competing scenarios, we present spectroscopic [Fe/H] estimates for asample of 26 compact objects in the central region of the FornaxCluster, covering the magnitude range of UCDs and bright globularclusters (18 mag<21 mag or -13.4 mag<-10.4mag). We find a break in the metallicity distribution of compact objectsat MV~=-11 mag (~=3×106 Msolar):for MV<-11 mag the mean metallicity is [Fe/H]=-0.62+/-0.05dex, 0.56+/-0.15 dex higher than the value of -1.18+/-0.15 dex found forMV>-11 mag. This metallicity break is accompanied by achange in the size-luminosity relation for compact objects, as deducedfrom Hubble Space Telescope imaging: for MV<-11 mag,rh scales with luminosity, while for MV>-11mag, rh is almost luminosity-independent. In our study wetherefore assume a limiting absolute magnitude of MV=-11 magbetween UCDs and globular clusters. The mean metallicity of five Fornaxnucleated dwarf elliptical galaxy (dE,N) nuclei included in our study isabout 0.8 dex lower than that of the UCDs, a difference significant atthe 4.5 σ level. This difference is marginally higher thanexpected from a comparison of their (V-I) colors, indicating that UCDsare younger than or at most coeval to dE,N nuclei. Because of the largemetallicity discrepancy between UCDs and nuclei, we disfavor thehypothesis that most of the Fornax UCDs are the remnant nuclei oftidally stripped dE,Ns. Our metallicity estimates for UCDs are closer tobut slightly below those derived for young massive clusters (YMCs) ofcomparable masses. We therefore favor a scenario in which most UCDs inFornax are successors of merged YMCs produced in the course of violentgalaxy-galaxy mergers. It is noted that, in contrast, the properties ofVirgo UCDs are more consistent with the stripping scenario, suggestingthat different UCD formation channels may dominate in either cluster.Based partly on observations with the NASA/ESA Hubble Space Telescope,obtained at the Space Telescope Science Institute, which is operated bythe Association of Universities for Research in Astronomy, Inc., underNASA contract NAS 5-26555. We describe the serendipitous discovery in the spectroscopic data of theSloan Digital Sky Survey of a starlike object, SDSS J103913.70+533029.7,at a heliocentric radial velocity of +1012 km s-1. Itsproximity in position and velocity to the spiral galaxy NGC 3310suggests an association with the galaxy. At this distance, SDSSJ103913.70+533029.7 has the luminosity of a super star cluster and aprojected distance of 17 kpc from NGC 3310. Its spectroscopic andphotometric properties imply a mass of >106Msolar and an age close to that of the tidal shells seenaround NGC 3310, suggesting that it formed in the event that formed theshells. We have obtained Space Telescope Imaging Spectrograph long-slit spectraof the central region of the advanced merger NGC 4194. The spectra coverthe wavelength ranges 1150-1750 Å in the UV and 2900-10270 Åin the visible. Results from the study of the properties of 14star-forming regions (knots) are presented. If the [N II] contributionis 40% of the combined Hα + [N II] flux, then the averageE(B-V)=0.7 mag. The metal abundances are approximately solar, withindividual knot abundances ranging from log(O/H)+12=8.1+/-0.5 to8.9+/-0.4. The Hα luminosities of the 14 observed knots yield atotal star formation rate (SFR) of ~46 Msolaryr-1. The sizes of the H II regions associated with the knotswere determined from L(Hβ) and range from ~28 to ~119 pc when afilling factor of 0.1 is assumed. The sizes are a factor of ~2.15smaller for a filling factor of 1. Using Starburst99, the EW(Hα +[N II]), and EW(Hβ), we estimate the ages of the star-formingregions to be 5.5-10.5 Myr. From ground-based spectra the effectivetemperatures of the H II regions are found to be ~11,000 K, and theelectron densities are determined to be ~530 cm-3. We findthat eight of the knots probably formed with a Salpeter initial massfunction truncated at an upper mass of 30 Msolar, and one ofthe knots likely formed with a standard Salpeter initial mass function.We suggest that the knots in our sample are the precursors of globularclusters. Two of the knots are in a region of flowing gas and are amongthe most massive, are the largest in radius, have the highest SFR, andare among the youngest of the knots.Based on observations with the NASA/ESA Hubble Space Telescope, obtainedat the Space Telescope Science Institute (STScI), which is operated bythe Association of Universities for Research in Astronomy, Inc., underNASA contract NAS5-26555. We present ground-based optical and Spitzer Space Telescope infraredimaging observations of the interacting galaxy UGC 10214, the Tadpolegalaxy (z=0.0310), focusing on the star formation activity in thenuclear, disk, spiral arms, and tidal tail regions. The ground-basedoptical data set spans a wavelength range between 0.3 and 0.8 μm, thenear-IR data set spans 1-2.2 μm, and the Spitzer IR data set spans3-70 μm. The major findings of this study are that the Tadpole isactively forming stars in the main disk outside of the nucleus and inthe tidal plume, with an estimated mean star formation rate of ~2-4Msolar yr-1. The most prominent sites of mid-IRemission define a ``ring'' morphology that, combined with the overallmorphology of the system, suggests the interaction may belong to therare class of off-center collisional ring systems that form bothshock-induced rings of star formation and tidal plumes. In starkcontrast to the disk star formation, the nuclear emission is solelypowered by older stars, with little evidence for ongoing star formationat the center of the Tadpole. Extranuclear star formation accounts for>50% of the total star formation in the disk and spiral arms,featuring infrared-bright ``hot spots'' that exhibit strong polycyclicaromatic hydrocarbon (PAH) emission, the band strength of which iscomparable to that of late-type star-forming disk galaxies. The tidaltail, which extends 2' (~75 kpc) into the intergalactic medium, ispopulated by supermassive star clusters, M~106Msolar, likely triggered by the galaxy-galaxy interactionthat has distorted UGC 10214 into its current ``tadpole'' shape. TheTadpole is therefore an example of an off-nuclear or tidal-tailstarburst, with several large sites of massive star formation in thedisk and in the plume, including the most prominent Hubble SpaceTelescope-revealed cluster, J160616.85+552640.6. The clusters exhibitremarkable IR properties, including exceptionally strong 24 μmemission relative to the underlying starlight, hot dust continuum, andPAH emission, with an estimated current star formation rate of ~0.1-0.4Msolar yr-1, representing >10% of the totalstar formation in the system. We estimate the mass of the largestcluster to be ~(1.4-1.6)×106 Msolar based onthe g'-band (0.5 μm) and near-IR (2.2 μm) integrated fluxes incombination with an assumed mass-to-light ratio appropriate to youngclusters, or large enough to be classified as a nascent dwarf galaxy orglobular cluster.